Ingredients: Brahmi, Vacha, Kust, Shankhapushpi etc. in Ghee. Therapeutic uses: Tonic for the brain. Indicated in epilepsy, insanity. 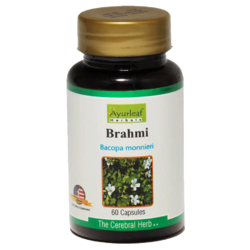 As a reputed organization, we are indulged in offering Ayurvedic Medicine (Brahmi Ghrita). - Therapeutic Use: Alterative, Diuretic And Brain , Also Useful In Mania, Epilepsyinsanity And Mental Disease. Alterative, Diuretic And Brain , Also Useful In Mania, Epilepsyinsanity And Mental Disease. The curd processed from the cow’s milk is churned to obtain butter, which is heated at a temperature to obtain ghee. This ghee is then processed with medicinal herbs to produce Ghrit. These are preparations in which ghee is boiled with prescribed kashayas. Thus active therapeutic principles of the ingredients are absorbed into the ghee and the ghee becomes an effective vehicle.